Debra Rigby Design is one of Londons leading full service home renovation experts. Debras expertise takes the confusion and stress out of design projects and saves her clients time and money in the process. Debra is an award winning interior designer with more than 25 years experience decorating & remodeling homes, kitchens, baths, condos and cottages London, St. Thomas, Grand Bend and other area communities. Debra is knowledgeable and involved in every aspect of remodeling from plans to material selections, general contracting to overseeing implementation of design, custom drapery and furnishings. She is an expert in colour, fabric and style, known for her attention to detail and her outstanding customer service. Clients use words like caring, my right hand, chock-full of industry insider info, reliable suppliers and trades and know how, effective solutions, excellent results, highly recommend with enthusiasm. We are a full-service firm specializing in designing, renovating and furnishing beautiful, timeless homes. We work with clients in the GTA, Halton, Oakville, Guelph and Kitchener-Waterloo. Ines' love for interior design began early as she discovered that the best part of owning a doll house was decorating it (her Mom is still trying to forget the day her heirloom hankies became Barbie's drapes). Today, she's just as happy working with clients on decorating projects as she is overseeing the design aspect of renovations and custom millwork. Peter's* unrelenting insistence on quality craftsmanship is something of a legend. As a contractor and talented carpenter, he takes great pride in ensuring every renovation is done right, every built-in constructed to last, every piece of moulding installed impeccably. There's no cutting corners on Peter's watch. Together, along with our team of highly skilled trades, we offer our clients one-stop service for their needs. With Ines' expert eye overseeing the design and Peter's highly effective management of the trades, you can rest easy knowing you will be delighted with the results. * So who's Kelly Hopter then? Ask us when we meet, we'd love to tell you the story! A Fine Design is a full service Interior and Exterior Design Consulting Business. We specialize in New Home Selections and Model Home Merchandising, offering full project management from start to finish. We offer consultations on Interior Decorating; including Space Planning, Color Consultations, Window Treatments and Home Staging. Principles Design Studio Inc is a full service Interior consulting company. With the knowledge and experience of our design and administration staff, our clients have access to all the information and product required to complete any size of design project. PEG Architecture + Interiors Inc.
Hampton Rowe Designs believes that your home is your sanctuary and focuses on creating harmonious spaces that optimize all around well-being through form & function. By seamlessly integrating restorative elements Hampton Rowe aims to improve the daily flow of movement in everyday spaces. Grounded spaces, brighter days and warmer nights are created through a focus on the psychology of design. The effects of this extend beyond walls and windows, creating a sharper focus and more peaceful state of mind. Contact Hampton Rowe Designs today to help realize your dream space and put you one step closer to a more balanced state of being. Grant Gilvesy Design (www.grantgilvesydesign.ca) is the multi-disciplinary design company of London-based designer, Grant Gilvesy. Grant brings together quality fittings and furnishings, both modern and vintage, to create an outcome that is sophisticated and timeless. Grant is also the founder of In Bloom Designscapes (www.inbloomdesign.ca), one of the premier landscape design firms in London Ontario, specializing in all aspects of exterior design and landscape design. 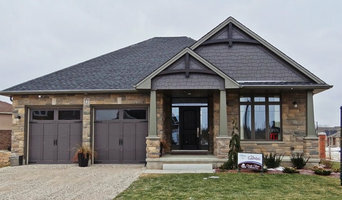 Design House London is an Interior Design Firm and Showroom in London, Ontario. With the highest level of attention paid to building relationships and providing exceptional client service, Design House London offers their clients fresh perspectives and creative solutions for living and working in style. At Ana Cole Interiors, our mission is to create stunning and functional spaces our clients love and enjoy. We achieve this by providing outstanding service and attention to detail. A B O U T Since graduating from Fanshawe College Interior Design Program in 2007, Ana has worked on numerous residential and commercial projects, notably OLG Woodbine and CADdetails Headquarters. Ana’s entire life has been impacted by interiors. From hotels she stays in when travelling the world, to boutiques, restaurants and interiors that surround her; she has a passion for drawing on all of this inspiration and putting it together. Known for bold colors, rich textures and layering patterns in her interiors, Ana's mutable style enables her work to range from colorful and eclectic, to minimalist neutral. She firmly believes that each client's space should be a reflection of their personal style and thrives on the design process as much as the end result - Clients' happy faces seeing beautiful, re-imagined spaces they love coming home to. Arlene is a Interior Decorator with over 20 years of experience decorating residential homes and commercial spaces. She specializes in colour coordination, space planning, furniture selection and fabric selection for custom draperies,& bedding. As an accomplished painter, she can also provide clients with one of a kind artistic complements such as hand painted furniture, canvases and murals. Orangetree Interiors is an online interior decorating (e-design) service that focuses on helping busy people create inspired interior spaces in an easy, convenient and efficient way. From the comfort of your own home, using our online platform, we'll work with you to design a space that embodies your personal style on a budget you can afford. Our goal is to create a beautiful and unique, personalized space that you love. We will make our best effort to make the design process a pleasant and enjoyable experience for you. Your satisfaction is our highest priority. SERVICES INCLUDE Interior decorating, colour consulting, room layout/space planning, 3D rendering, room re-fresh and/or makeovers, furniture selection, lighting, accessorizing, guidance for window treatments, art placement, etc. FEES Fees range depending on scope of project, ranging from $50 to $700/room on average. 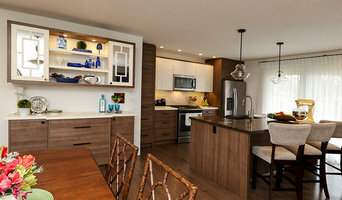 SERVING Home owners or renters with large or small spaces across North America. 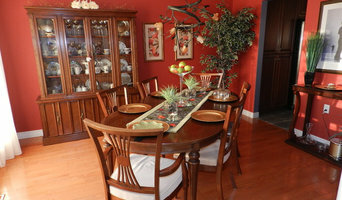 Interior Design & Décor As a designer my goal is to assist my clients in succeeding to create the homes they dream of - the stage where they and their families can live. Having built my design career in London and area I have a vast understanding of clients needs and helping to carry out those needs to completion. Superior attention to detail and a one step ahead mentality married with my passion for design allows for only the best end product. Established in 1993, Under Foot Inc has been providing clients all over Southwestern Ontario with superior flooring products, customer service and installations. A one of a kind showroom located in Southwest London is open Monday-Friday 10-4 or evenings and weekends by appointment, ensuring complete customer care and satisfaction. The showroom features a vast array of thoughtfully selected hardwood (both solid and engineered), tile, natural stone, vinyl plank, laminate and carpet samples at many price points to suit any budget. We also offer the design expertise of Joanne Brockmann, a very well established and respected designer who has completed projects throughout London and much of southwestern Ontario. So if you're debating what to put underfoot, call Under Foot, and we'll help you every step of the way. The work of a professional can make all the difference. Whether your home has 10 bedrooms, or your apartment is 800 square feet, it can be tricky to create a cohesive look that is representative of your style. That's where a local Saint Thomas interior designer comes in. A home decorator will help distill your tastes and ideas into a design that suits the needs of your space. Whether you need help creating a functional space plan, rearranging existing pieces, designing the inside of a new home, or simply sourcing amazing furniture and decor, seeking the help of professional interior designers and decorators in Saint Thomas, ON is a must. A good home design professional will hone your style down to its very essence and be able to choose a functional layout that feels natural to you. Interior design companies can be involved as much or as little as the client desires. Many clients who hire an interior decorator in Saint Thomas, ON — particularly those who are remodeling — have a good sense of how the room should look and what products they should use. Often clients will insist that interior decorators use the products already present in the house. Other times a designer will need to start from scratch — especially if this is a newly purchased or just-built home. An interior design company will need to figure out exactly what the client needs, which includes organizing rooms, picking flooring and wall colors, and finding furniture to complement it all. Sometimes that means he or she will have to recruit help from other Saint Thomas, ON home professionals to help create the perfect look for your renovation. Here are some related professionals and vendors to complement the work of interior designers & decorators: Architects & Building Designers, General Contractors, Home Builders, Design-Build Firms, Photographers. Do your research before meeting with an interior designer or home decorator in Saint Thomas, ON. Ask yourself what you want your space to become and what it will be used for. Figure out the extent of what you need help with, what your must-haves are and what your budget is. Interior design services can add up fast, so be up front with a potential design firm or individual from the beginning. Also, pick an interior decorator that fits your style. Browse through the portfolios of different Saint Thomas interior design firms and decide if you would live in those houses. Just because you like something doesn’t mean you could live in it. There's a big difference! Find an interior designer or home decorator in Saint Thomas, ON on Houzz. Narrow your search in the Professionals section to find Saint Thomas interior designers near you. 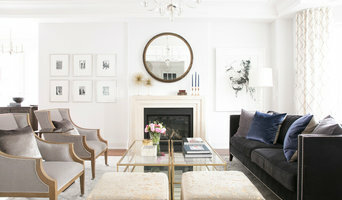 You can also look through Saint Thomas, ON photos to find a room you like, then contact the design firm who designed it.